The odor from marijuana can quickly accumulate on carpet fibers, walls, ceiling and other surfaces. 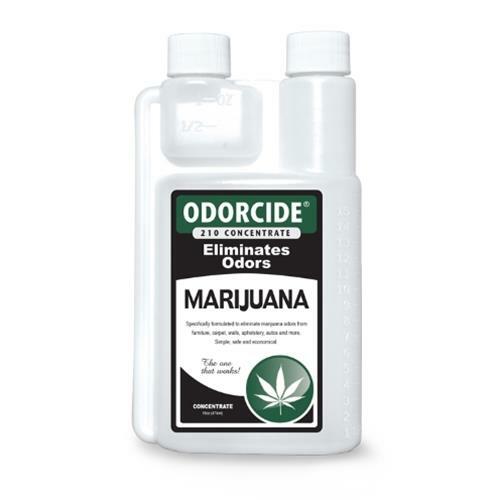 Odorcide Anti-Marijuana works through a process of counteraction and chemical absorption to safely but effectively eliminate the odor. As a concentrate, Odorcide Anti-Marijuana can be mixed with water or cleaning agent and applied using spray, fogging or cleaning procedures. Designed to work in pressurized or trigger sprayers on small affected areas or materials such as drapes, upholstery, furniture, etc. In vehicle interiors as a spray and/or wipe on for all surfaces, fabrics, and air handling system. Add 4-8 oz of concentrate to 1 gallon of water or cleaning agent.. Apply directly to surfaces affected by the odor ensuring the product reaches the odor source. Absorbent cloth materials must be saturated to guarantee the solutions reaches the malodor. If possible, allow the items to air dry (fans or dryers can be used to accelerate the process.) Repeate, if necessary, to effectively reach the odor source in all areas.